Deal update: Head over to Amazon and pick up two all-new Echo Dots – which usually cost £49.99 each – for only £59. This bargain bundle will save you £40 in total and costs just a tenner more than the price of one hands-free Smart speaker. Back in September, Amazon released the largest refresh of the Amazon Echo range including a second Amazon Echo, Echo Plus, Echo Buttons, Echo Connect, a new 4K Fire TV Stick and the Echo Spot. Now, there’s a new Echo Dot in town specifically aimed at children. Imaginatively titled Amazon Echo Dot Kids Edition, the smart speaker comes in three colours – blue, green and red – and retails for $79.99. At the moment, the device is only available in the US and Amazon UK said it has “no news to share regarding any UK launch.” However, given that the majority of September’s new Amazon Echo releases took around three months to jump across the pond, we would expect the Amazon Echo Kids Edition to launch in the UK later in the summer. Ultimately, outside of the new design, Amazon Echo Kids Edition is the original Echo Dot running a new software skin. On the new Dot, Alexa will play music, answer questions, read stories, and tell jokes with “younger ears in mind”. It will automatically filter explicit songs from Amazon Music, and parents can use the Amazon Parent Dashboard to control how Alexa interacts with their children. This lets you set daily time limits, review activity and pause Alexa on the device (features which are also available on standard Echo devices). This builds on the launch of Alexa Skills for children, aimed at users under the age of 13. Amazon recently opened up its platform to allow developers to build child-friendly apps and games and, at launch, the Alexa Kid Skills included The SpongeBob Challenge from Nickelodeon, Sesame Street from Sesame Workshop, and Amazon Storytime. The first time you add a child-friendly Alexa Skill, you’ll need to enable it in the Alexa app. Imagine, if you will, the Amazon Echo. Now saw the bottom three-quarters off and throw it away. What you’re left with is the Amazon Echo Dot. Dot, as I’ve taken to calling “her”, is either a version of Echo for people who already have perfectly good speakers or one for people who don’t really care about sound quality. It’s all the goodness of the Alexa voice assistant without the large speaker that comes with its sibling. Almost all the same voice-activation features hardware are there, such as the seven microphones and the light ring. 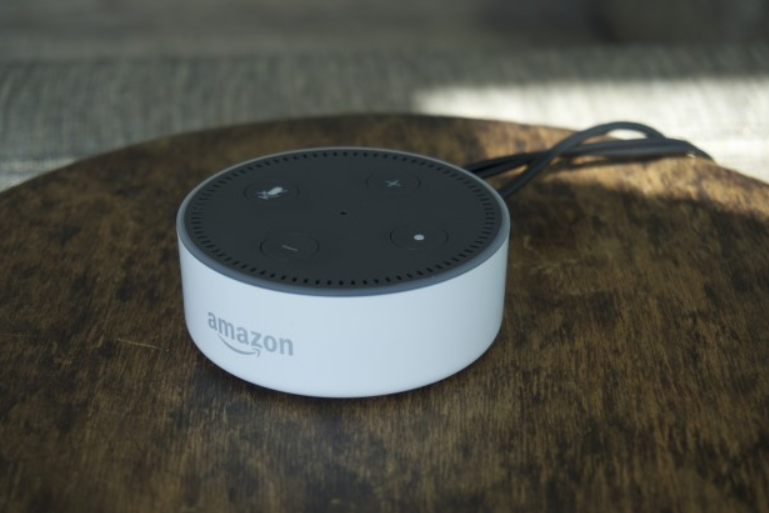 The one exception is that, unlike the Echo, the light ring on Echo Dot doesn’t twist to change volume – you have dedicated volume buttons instead. Setup is just as simple as its larger sibling, however. Connect to it via Wi-Fi using the iOS or Android app, point it at the correct Wi-Fi network and away you go. You can choose to use the built-in speaker, which is basically useless for music unless you want a tinny retro transistor radio sound or connect to external speakers using Bluetooth or a 3.5mm jack. 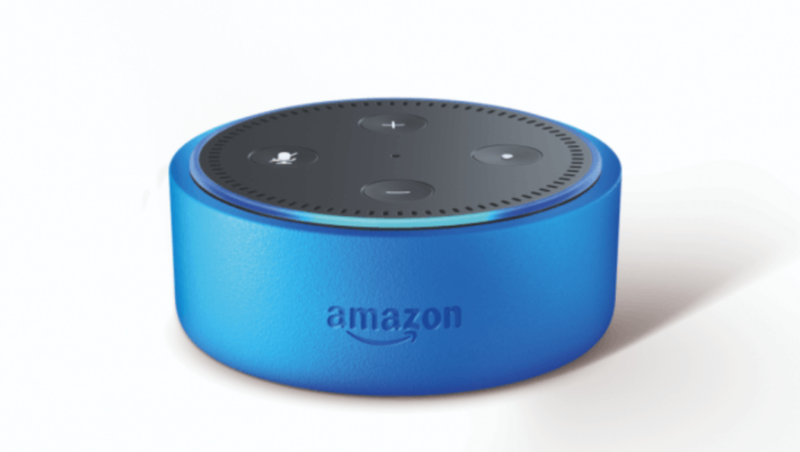 What makes both the Echo and Echo Dot more than just hi-tech paperweights is their ability to recognise your voice and pipe it to Alexa, Amazon’s smart voice assistant. Alexa on the Dot works exactly the same job as it does on the Echo, so you can do all the usual stuff, such as playing music (via Amazon Prime and Spotify) and radio (via TuneIn) and whatever else you have apps set up for. If you already have an Echo, all the same, “Skills” you have “taught” Alexa will be set up and work. In a sense, it’s “your” version of Alexa, whether you’re using Echo or Echo Dot. The voice recognition is exceptional, more accurate in my experience than Apple’s Siri or Google’s Voice Assistant. Thanks to its aforementioned Skills, Alexa’s capabilities are also growing constantly. Skills let developers create actions for Alexa to recognise. For example, the Uber Skill allows you to call a car using Uber, while the Just Eat Skill will let you reorder your last takeaway. It’s good, but is it great? Echo Dot does have a few drawbacks. There’s no battery option, which means you can’t simply move it around to whatever room you’re in at the time. Given that it’s small enough to be pocketable (if you have big pockets, at least) this seems like an oversight. As mentioned, the built-in speaker is tinny and pretty horrible for anything other than voice responses and talk radio. These negatives are outweighed by the positives, however. First, you can attach the Dot to an existing speaker or Hi-Fi system via a standard 3.5mm analogue output, so you can boost your audio quality easily. You can hook it up via Bluetooth and stream audio to another wireless speaker as well if you don’t fancy having cables trailing all over the room. The biggest advantage by far, however, is that it’s much, much cheaper than the regular Echo; £100 cheaper at a mere £50. This transforms the Echo Dot from considered purchase to impulse buy and, for a technology still in its infancy relatively speaking, that’s important. And that price is a really important point. Echo Dot costs just £50, which makes it much more affordable than the bigger Echo, especially if you already have a decent speaker you can use with it. Is it worth the money? Having used Echo for while I’ve found that the biggest use for it is as a glorified radio alarm clock. “Alexa, play Radio 3”. “Alexa, turn off in one hour”. “Alexa, set an alarm for 6.30am”. And, occasionally, “Alexa, add razor blades to my shopping list”. However, with the capabilities of Amazon’s voice-powered assistant growing by the day, there’s a lot more you can do with it than just this. The latest and, perhaps, greatest thing you can do with the Echo Dot is to use it as an intercom to call room-to-room to other Echo devices. To do this, you first need to give each individual Echo a room name in the Alexa app, enable “drop-in”, then you’ll be able to say “call the kitchen” to talk to your other half if you can’t be bothered getting up from the sofa in the living room. If you’re thinking of having multiple Echos and Dots around the house, though, it’s worth knowing that each device is effectively its own version of Alexa. For example, if you set a timer on an Echo in the kitchen, the Echo Dot in the living room isn’t smart enough to alert you when it runs out and you’ve gone to sit there. That makes sense, of course – Echo doesn’t know where you are – but it would be a great feature to have. This makes the £150 Echo an expensive novelty and the £50 Echo Dot a much more viable proposition if you want to check out the leading edge of voice assistants. Voice might not yet be right for you, but Echo Dot is your chance to find out without breaking the bank.